Here is the plan view of the cave. Below is a drawing of the Large Portal, to the North. The portal above goes into the opening pictured below. Note the floor will come up almost a foot when it is poured. The door is recessed about 3' back from face of the opening which is about where the stick is leaning up against the wall in this picture. Another major coat of shot crete remains to go on. Reclaimed barrel wood means wood reclaimed from large redwood wine tanks not oak barrel staves from 60 gallon oak barrels. 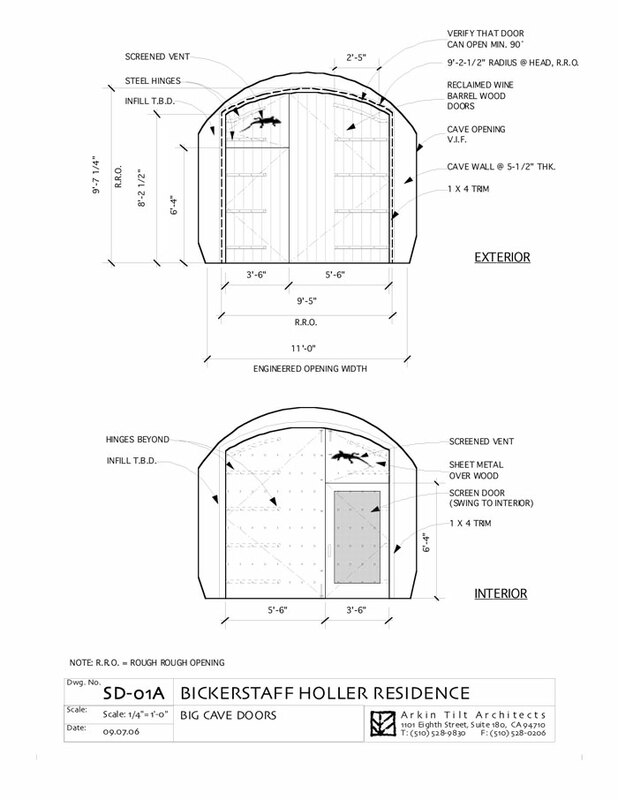 Small Portal plans below. It faces East South East. 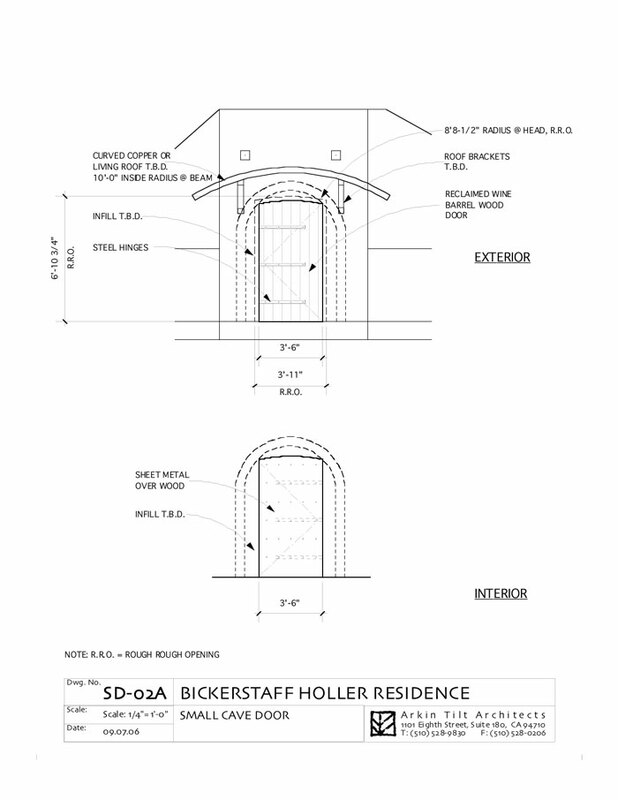 Below are some sketches in progress showing the roof over the small portal door. This is a closer view of the same. This is an unusual portal interface to the cave necessitated by not having enough brow at the top of the stairs to inset the door like the large portal. 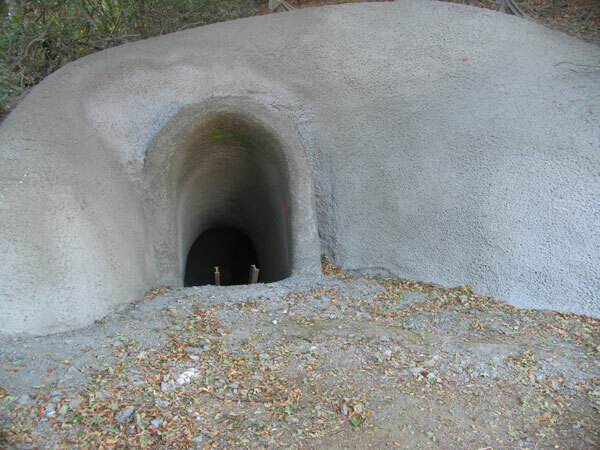 The general idea is to mount the door on an exposed shotcrete face and then cover the joint with a roof to protect the door. The roof basically takes the place of the brow. 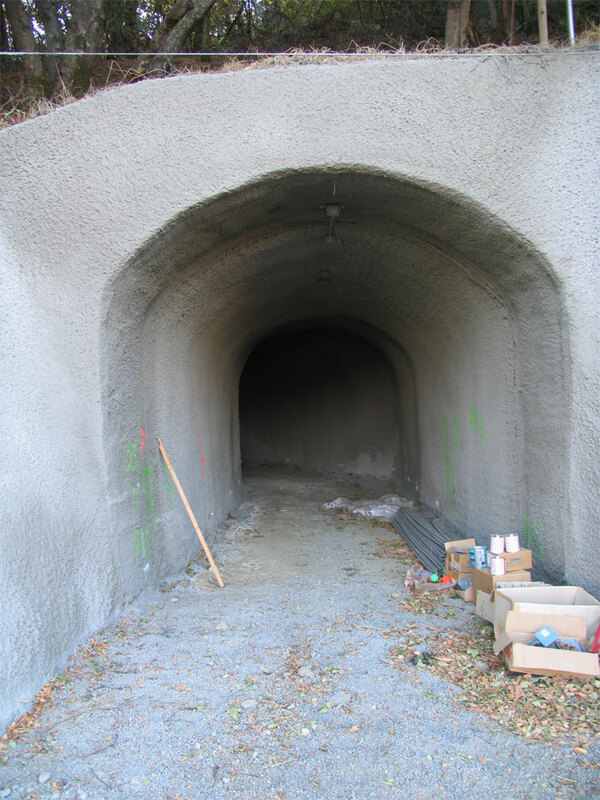 Water coming down the shotcrete face behind and above the portal will fall into the "saddle" behind the portal facing and run down the sides of the shotcrete behind the door face. Here is a picture of the portal face as it exists now. Again note that as of 11/16/06 there is another major coat of shotcrete remaining to be done which provides an opportunity to fine tune the geometry of shotcrete face. 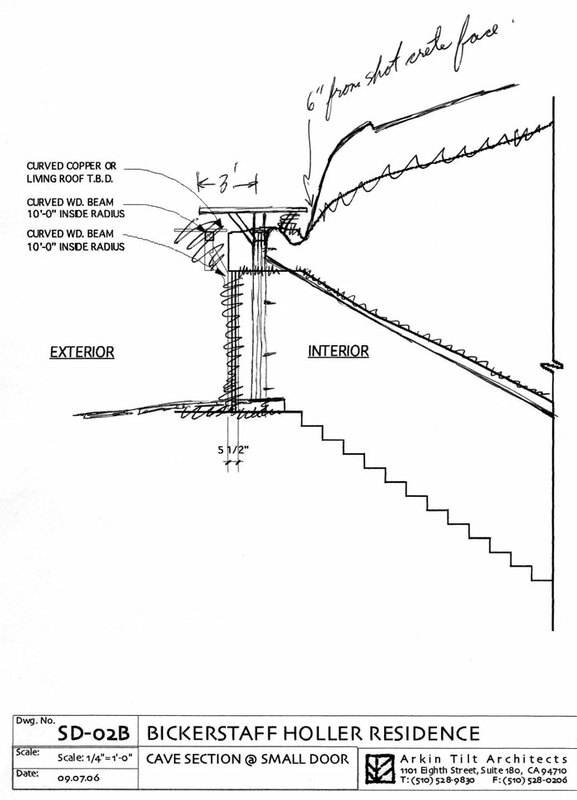 Note that the final threshold of th door will be about where the top of the wooden stairs end. The patio stonework will slope away from the door. 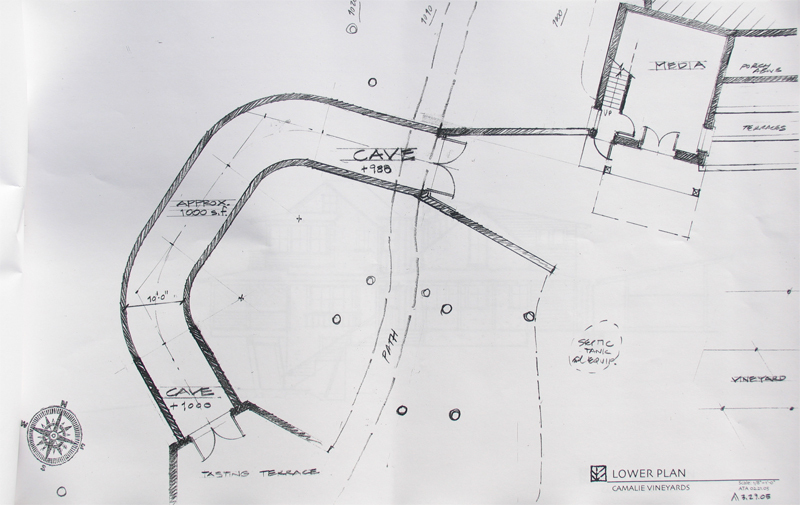 The cave on the plan above is a simplified first version. It does show the relationship between the apron of the north portal to the cave to the media room of the house correctly. The elevation at the base of the media room door that swings out onto the apron is 991ft. 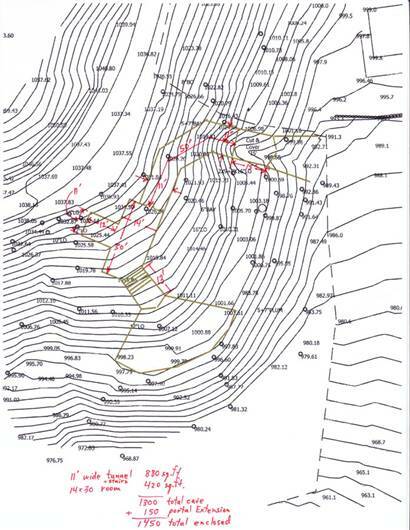 The next image below is a detailed scale view of the cave which shows elevations and square footages. 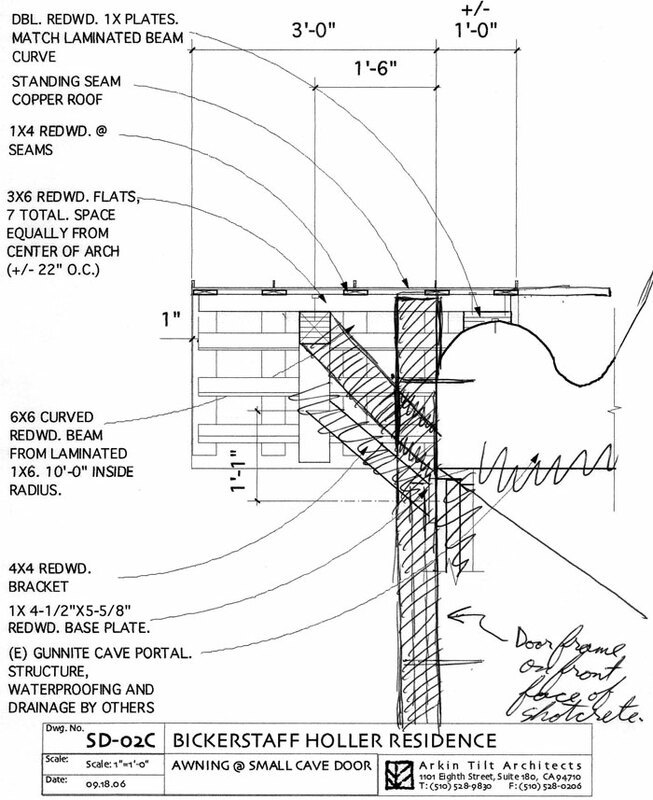 Below is an early sketch of the smaller portal which is now obsolete. Total Floor area: ~1452 sq. Ft.
Ceiling 12 ft. except for enlarged room which is more like 14' high. Rise of stairs from 991' elev to 1000' about 9ft. on topo. More like 12 ft. by eyeball. Topo with Cave that can be panned and zoomed and layers added or removed.